With the League of Legends World Championship just around the corner, Riot have already got started on the next year’s worth of patches, updates, champions and reworks. 5.19 is the first of those, with Worlds going to be running on 5.18. 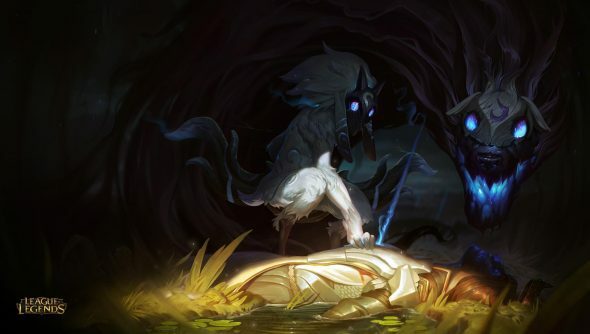 It brings with it Kindred, the game’s latest champion, a minor heap of buffs, nerfs and fixes as well as a significant change to the way jungle creeps behave. Kindred is designed to function as a big damage dealer who spends the early game in the jungle. They are actually two units at once, a masked hunter called Lamb and a big dog-friend called Wolf. They can mark targets to give permanent damage buffs, while their ultimate prevents any unit in a target area – friend or foe – from dying for a short period, then heals them at the end. Useful if your team gets caught, but won’t allow you to kill them any more than they you. The changes to the jungle are focused on improving the predictability of various large mobs, meaning key moments focused on them won’t be quite so random. There is no a new stat that each jungle mob has, called Patience, that governs how long they will focus on targets for. Pull them too far from their camps, or force them to switch targets too often, and they’ll reset. This can now cearly be seen with a bar above each important mob’s head and also nerfs some of the weirder tactics that were available. Via fansite [email protected], there’s also a bunch more skins just been added to the Public Beta Environment, usually meaning they’ll be hitting in a near-future patch of their own. Both Demon Vi and Cosmic Reaver Kassadin look pretty sweet, so check ’em out. 5.19 is now live and you can read the full patch notes over on the official site. Kindred isn’t enabled yet, but should be very soon.